Dark side of Kashmir police. 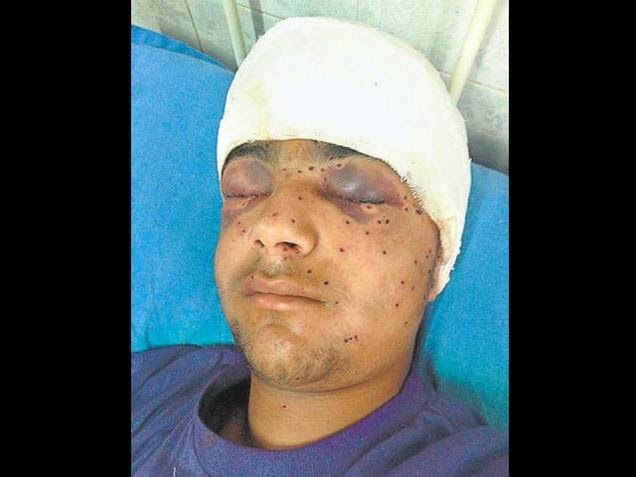 Hamid Nazir Bhat, 16, has lost vision in his right eye pierced by pellets, and nearly a hundred of these tiny iron balls have pierced his skull, jaws, lips, nose and brain. The police fired them during a protest in his village, Palhalan, in north Kashmir on 21st may 2015. The high-velocity pellets caused a vitreous haemorrhage in the right eye, and now his left eye holds out the only hope, Waseem Rashid, an ophthalmologist at Sher-i-Kashmir Institute of Medical Sciences. The doctors say several patients have over a hundred pellets lodged in their skulls because they were hit from a distance of less than two feet with guns aimed at their faces. According to the resident Dr. Rashid: over the five years since the mass protests in 2010, he had seen scores of such cases. But no definite record is available on the number of people disabled by pellet guns; doctors at the Bemina hospital and Shri Maharaja Hari Singh Hospital put the figure at more than 700. Sources said that despite a government order that pellet guns be used sparingly in Srinagar, they are used regularly in the downtown areas of the city and across villages in the Valley. Police officers say one cartridge contains 400-500 pellets, resembling ball bearings. They come in grades of five to 12, five being the largest, fastest and with the widest range. “Though written instructions have been given to use the number 9 pellet for crowd control, as it does not cause lasting damage, the directive isn’t followed. In villages, we see number 6 and 7 pellets being used regularly,” a senior police officer said. Most sensitive police stations in Kashmir receive regular supplies of number 5, 6, and 7 pellets, sources said. “Many of our patients run away from the hospital with pellets and pus in their eyes because police spies note down their details, arrest them and often extort money,” an administrator said. Most cases of injuries caused by the indiscriminate firing of pellet guns by the Kashmir Police are reported from Palhalan, Pattan, Old Town Baramulla and Sopore in north Kashmir. In south Kashmir, Tral, Pulwama, Qoimooh and several other places have been affected.